A Games Programming and Design student at NCC is project managing the development of a website for a Barrowford business after winning a competition to design its new company logo. 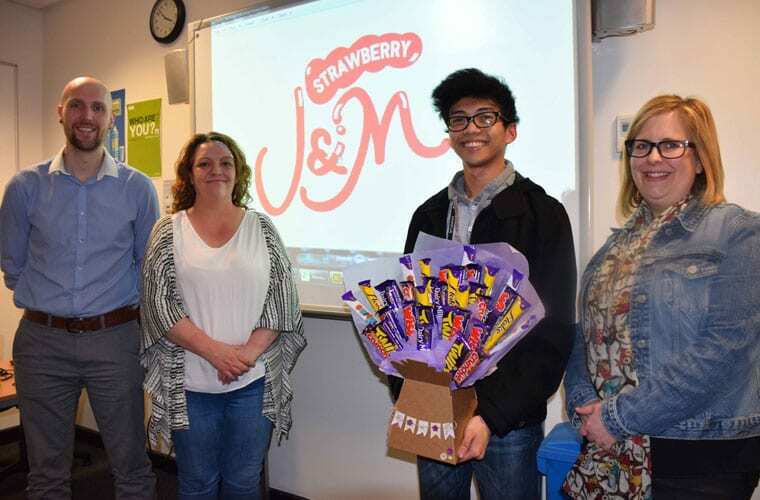 Level 3 student Tyron Tuzara, 17, has designed the new logo for Strawberry J&M after business partners Rebecca Ashworth and Hannah Stobbs approached the College for inspiration. And off the back of his stellar efforts, Tyron, from Burnley, is now leading the project to redevelop the website for the burgeoning business, which is also involving two of his student colleagues Will Campos and Adrian Trutkowski. The project is a different and interesting challenge, but Tyron, who has an unconditional offer to study Game Art at Staffordshire University, is relishing the chances that have come his way. Tyron said: “I really enjoyed designing the logo as it allowed me to use Adobe Illustrator which was something new to me. I never really pictured myself doing logo design but I liked the creativity it gave me. “Now I’m managing a project to redevelop the Strawberry J&M website. This is another separate project to College work and is working the same way a web designer would with a client. It is a great chance to challenge and express myself. Strawberry J&M are based in Higherford Mill and Rebecca and Hannah’s growing business creates chocolate and sweet bouquets and trays for birthdays, parties and other events. Hannah said: “We thought all of Tyron’s ideas were fantastic and we had a tough decision choosing a winning design. “We do a lot of our business through Facebook but we liked the idea of having a website as it will give us a more professional image. Alongside his studies, Tyron has also taken part in various extra-curricular activities at NCC, including being a keen member of the College’s Games Club. He also played a key part in NCC reaching the final of Digital Advantage, a ground-breaking digital project which pitched NCC students in a Dragons’ Den style competition against colleges from across the county with their app Ubudg.it, aimed at improving the lives of University students. Tyron’s tutor Andrew Ashworth said: “Tyron is an absolutely brilliant student and his designs really impressed Rebecca and Hannah. “The opportunity he now has to develop the website, alongside Adrian and Will, is exactly the kind of experience students need to develop their skills further for the future and it is something that we offer on a regular basis here at NCC.